If you are diabetic or provide care to an individual who has diabetes, you are aware of the extreme necessity of taking care of a diabetic’s feet, among other precautions to maintain health. ** I review these creams further down the page if you want more information. Here is a review of some of the best foot creams available in the market for people with diabetes. Specially made for dry skin, this products is a trusted foot cream that has been used for years. 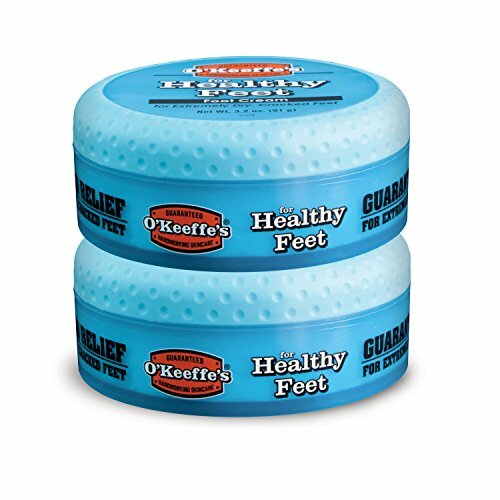 O’Keefe’s brand is a well-trusted brand among consumers and this is another wonderful product from them! The lotion has a thick consistency that gets absorbed into the skin readily, hydrates the skin without making it greasy and creates a protective barrier over the skin to prevent further loss of moisture. It is also unscented and hypoallergenic, so you can rest assured that this foot cream does its job well without causing unnecessary side effects due to added fragrances and colours. It gets absorbed in a matter of minutes, repairs cracked heels and thus helps prevent major infection risks by healing broken skin. The best time to apply this is right before bed after cleaning your feet thoroughly. This is a multipurpose cream that not only moisturises but as the name suggests, also offers temporary respite from pain due to neuropathy, blisters, bruises, calluses and arthritis. While diabetics are often cautioned against applying moisturising creams between toes as the moisture might cause fungal infection, Anastasia Healthy Skin is easily absorbed into the skin, thus eliminating chances of infection due to moisture retention which makes this a wonderful pain relieving cream. It offers the twin benefits of hydration and exfoliation to dry skin, that is, it moisturises and also aids in the removal of dead skin that makes your feet rough and dull. It is specially formulated to tackle the foot-related problems associated with diabetes and is therefore composed of physician-approved ingredients. An added plus is that it is suitable for use not just for the feet, but for all other body parts. 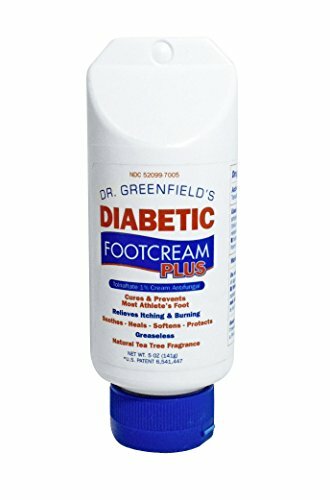 Another foot cream that is specially designed to assist diabetics in foot care, Dr Greenfield’s Diabetic FootCream Plus is an anti-fungal preparation that works effectively to fight off infection. It is targeted towards the commonly occurring athlete’s foot, which causes redness, scaling and itching between the toes – a vulnerable area for diabetics. The active component in this formulation is tolnaftate 1%, which is clinically proven to fight fungal infections. With regular usage, occurrences of athlete’s foot and ringworm can be decreased. In addition to acting as an antiseptic, it also softens the skin, heals calluses, broken skin and bruises to provide moisture without the risk of contracting an infection, and this works perfectly for diabetics whose feet need special attention. 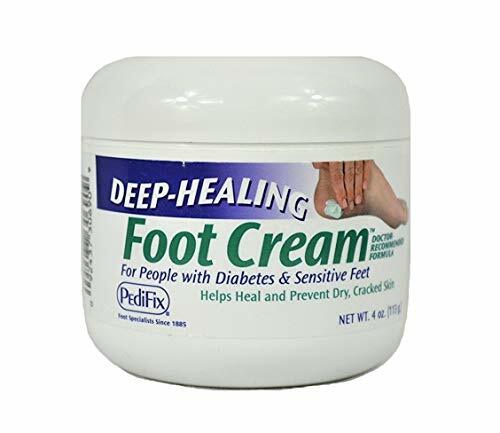 The Pedifix Deep Healing Foot Cream is an excellent option for everyday care of your feet. It hydrates dry skin, repairs cracked heels and nourishes your skin with its non-toxic, vitamin-enriched formula. It is hailed for its superior hydration power with just a few days of usage. It can heal visibly dry, undernourished and cracked heels with regular application. Its fragrance-free formula is safe for use by diabetics as well as people with sensitive skin. It also softens calluses, and is ideal both for everyday care, and concentrated treatment of conditions resulting from dry skin in diabetics. 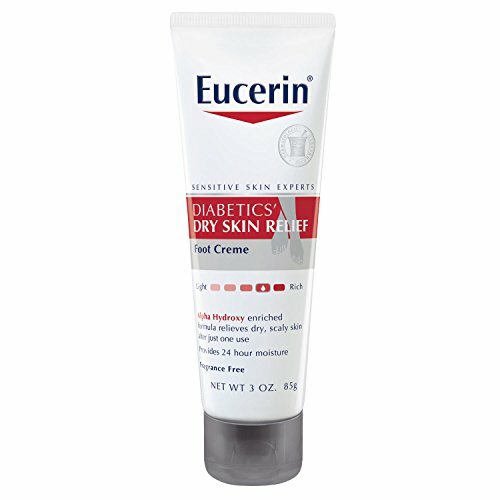 Diabetics require constant care of their feet, and Eucerin cream offers just that. It results in visibly softer and more hydrated skin after just one application. It comes with an easy to use and hygienic tube packaging, which makes economical application feasible as well as sanitary. The formulation is enriched with alpha hydroxy acids (AHAs) that are clinically proven to provide nourishment to dry, rough skin. It is readily absorbed in the skin, does not leave a greasy residue and does not irritate the skin with unnecessary fragrances and other additives. All diabetics, given their vulnerability to foot injuries and consequent hazards should make skincare for their feet an essential part of their routine. In addition to prevention of damage and regular checking of feet for injuries, people with diabetes should also include regular checkups with their podiatrist and a careful and regular care routine to keep nails trimmed and skin clean and hydrated, to ensure that their feet are at their best health. Choosing the best diabetic foot cream to suit your needs and address all your issues also goes a long way in keeping your feet nourished and preventing risks to your health. Why do you need to use foot creams if you are diabetic? It is imperative you, as a diabetic, take care of your feet because the condition results in a disorder called diabetic neuropathy. Diabetic neuropathy causes nerve damage. If your nerves, especially at the extremities like hands and feet, are damaged, they become numb and lose sensation. In such a case, if there is any injury to your foot, it could go unattended for a long time before you even notice. The situation is exacerbated by the slow healing process that is characteristic of diabetes, and the wound, even if it is a minor cut or a hangnail, could develop an infection. If the infection becomes serious before treatment is sought, it could lead to deformation, and even call for an amputation to prevent its spread further inside the body. You are also at a greater risk for foot ulcers, fungal growth and blisters. Skin that is either too dry or constantly under humid conditions is more vulnerable to damage. To avoid this, carve out time for regular foot care. You will need to keep your surroundings hygienic, exercising precaution to prevent injuries to your feet and check regularly for any damage. You can also invest in a good foot cream that not only keeps the skin on your feet hydrated and healthy but also fights off infections from minor wounds. This video from the Mayo Clinic explains the 5 steps to implement and importance of diabetic foot care.